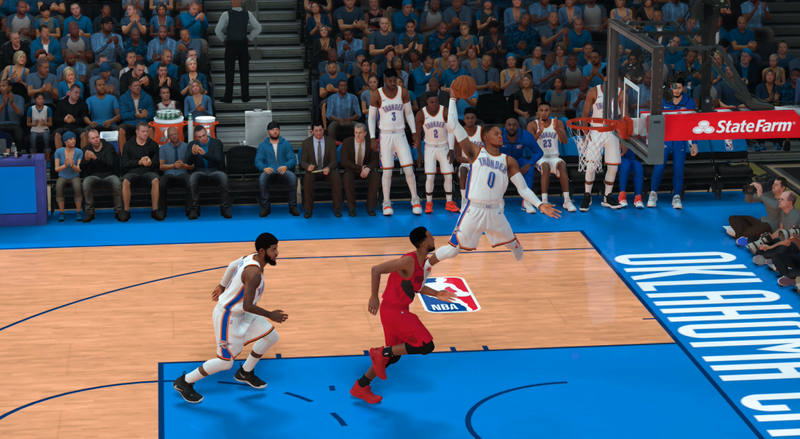 Andrew wrote: You've definitely got virtual Westbrook playing like his real life self! 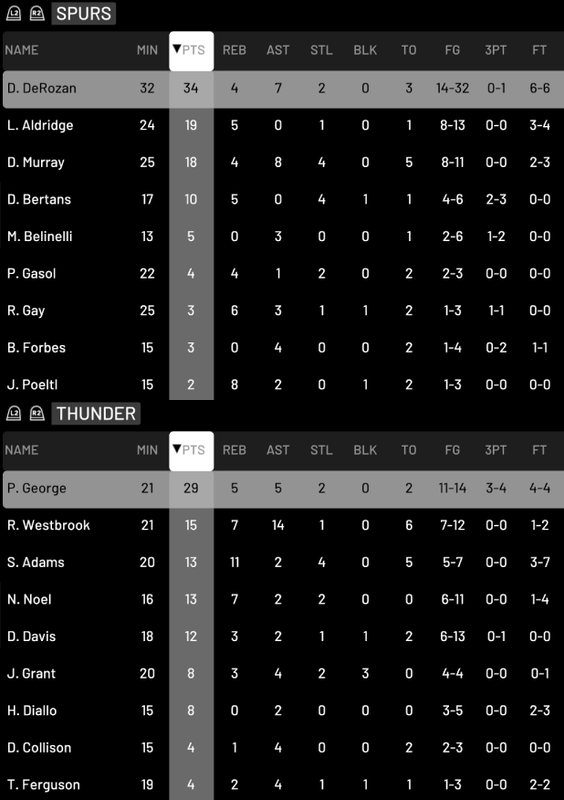 I've definitely moved towards having Paul George as the primary scorer recently. 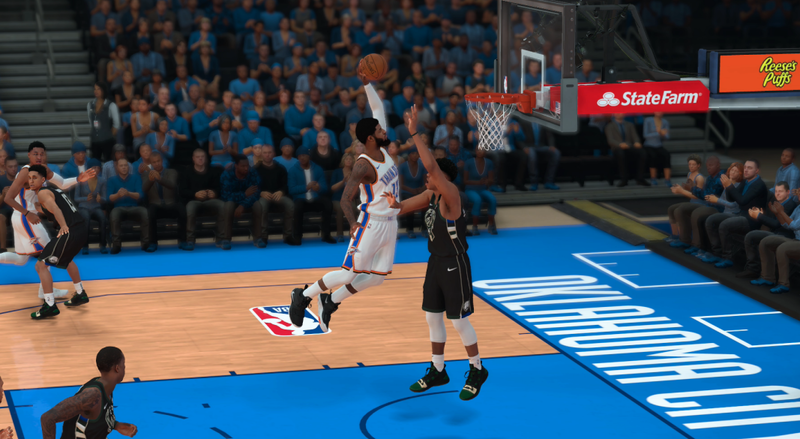 I also try to avoid taking many three pointers with Westbrook. It's just not his game. He is a great defender. That block on LeBron in the screenshot was particularly crazy with how high he got to do it. The gameplan sure seems to be working out so far. Trae Young went down injured 1 minute into fourth quarter with a right ankle sprain. He sat out the rest of the game and will miss 4-6 weeks. Unlucky for the Hawks. 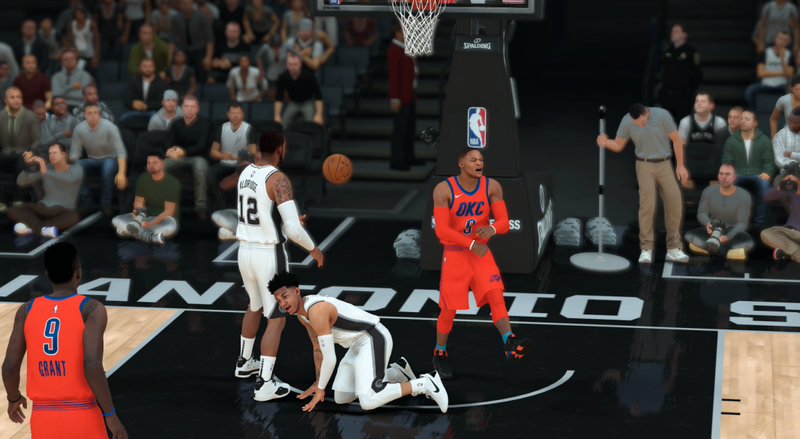 Westbrook broke his career-high assist mark for the second time this season. He had a massive third quarter and that set up the win for us. Huge night for Westbrook. Shame the sim engine saw fit to break your winning streak, though. 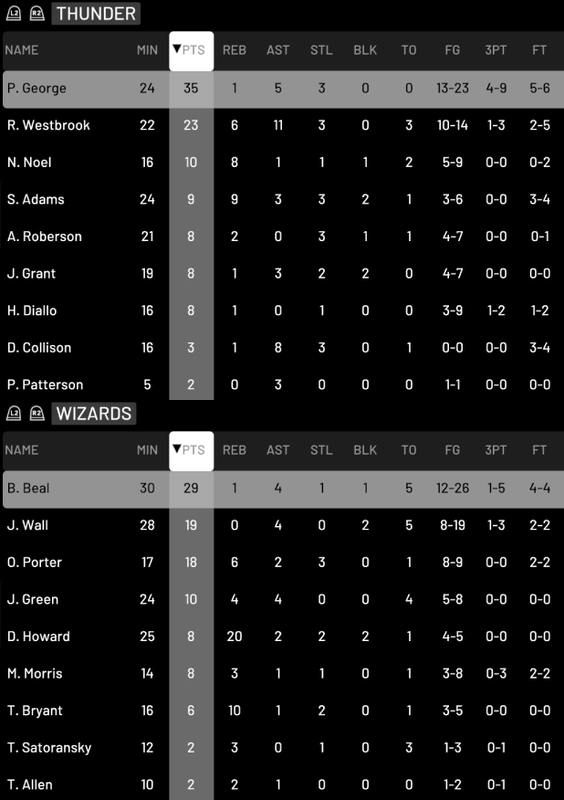 Andrew wrote: Huge night for Westbrook. Shame the sim engine saw fit to break your winning streak, though. 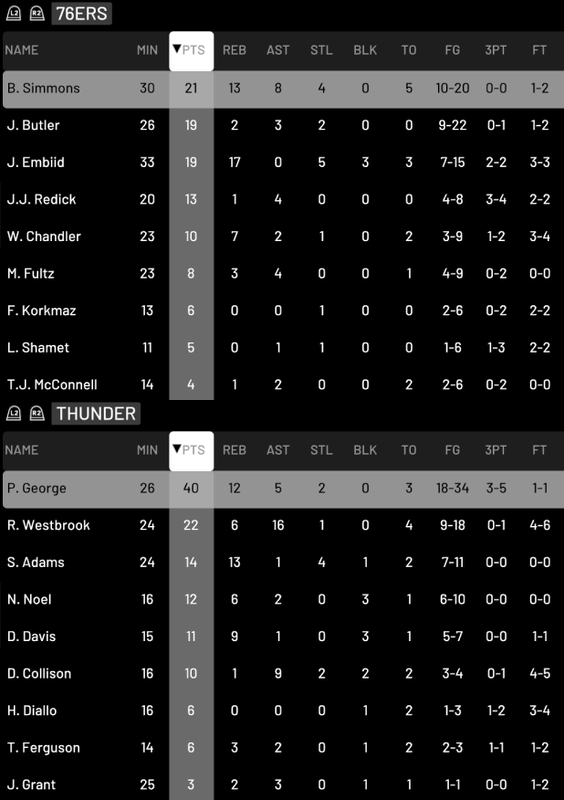 Nice to see Simmons put up numbers too, but better to see George and Westbrook filling the stat sheet in another win. 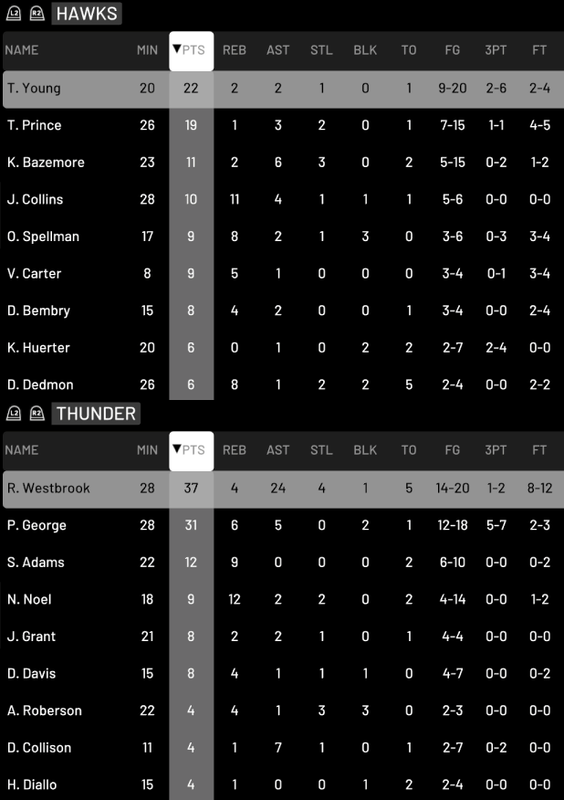 Andrew wrote: Nice to see Simmons put up numbers too, but better to see George and Westbrook filling the stat sheet in another win. Another great game for Adams there. Shame he couldn't have had a few more blocks to fill the stat sheet, but still fine numbers in an impressive win. 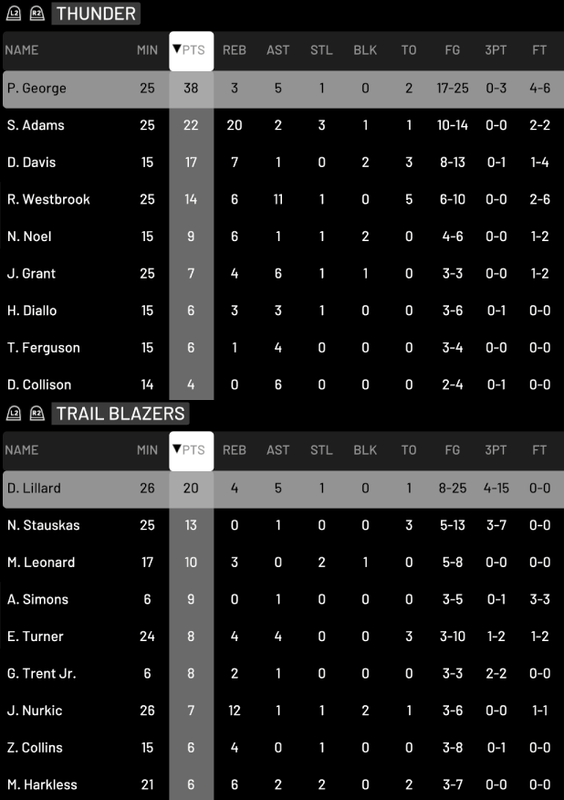 The Blazers sure did miss McCollum. Giannis fouled out with one minute remaining. His absence really allowed us to come back and win the game. 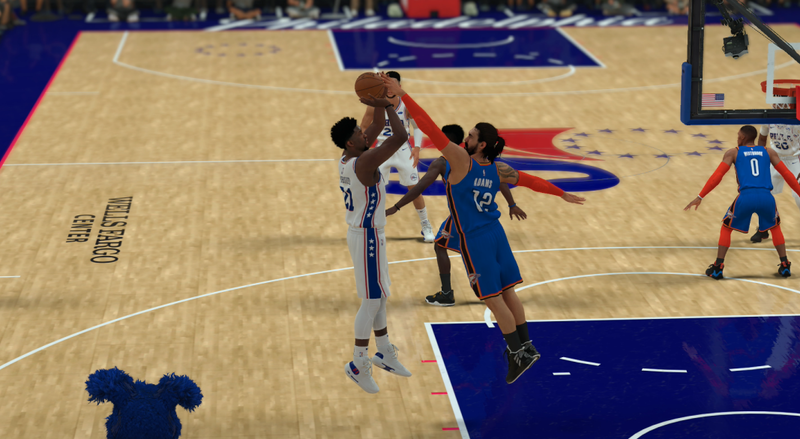 Not the prettiest game-winning shot, but a bucket's a bucket! Big time block by Patterson to preserve the win, too. 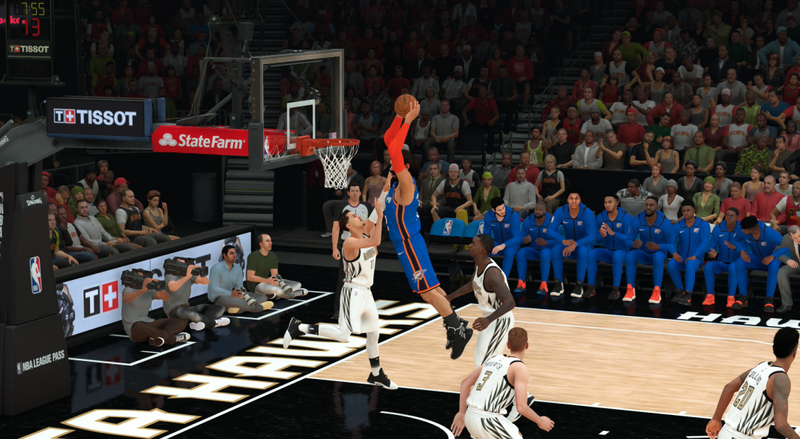 Andrew wrote: Not the prettiest game-winning shot, but a bucket's a bucket! Big time block by Patterson to preserve the win, too. 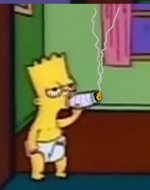 It was a weird animation that felt like slow motion. But I was happy to beat one of the top teams from the east. It's the news that all New Orleans Pelicans fans have been dreading for years. 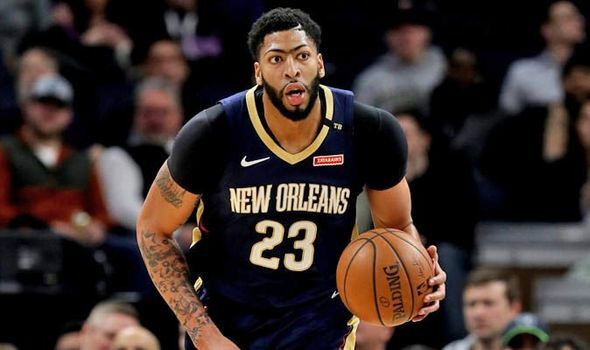 Superstar Anthony Davis today informed team management that he had no intention of signing an extension with the franchise and wanted to be immediately traded to a contending team. Davis has been with the Pelicans since they drafted him with the first overall pick in 2012. 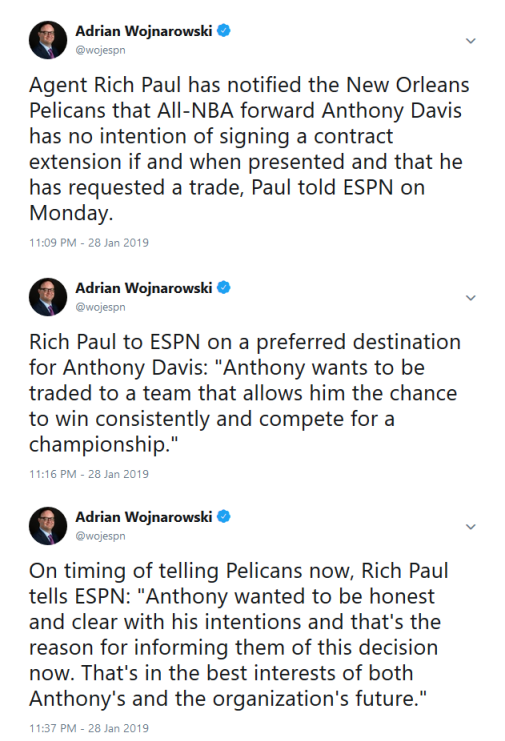 The timing of this request by Davis is somewhat odd as the Pelicans are currently sitting in sixth place in the extremely tough Western conference, with a 25-25 record. 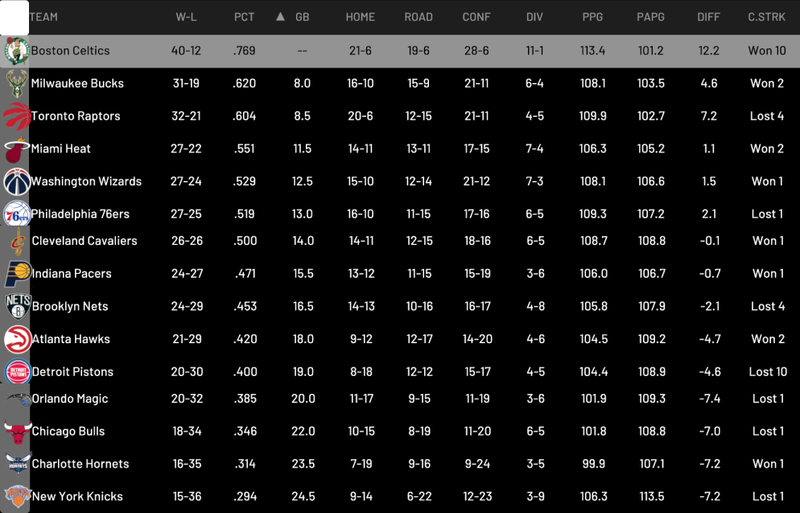 New Orleans are right in the middle of a really close race for the final playoff spots. 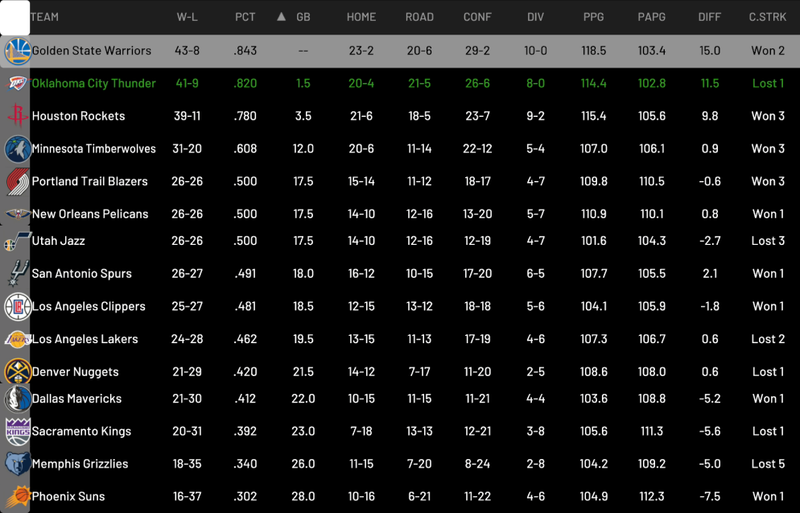 Fifth-placed Portland are just two games ahead of the tenth-placed Los Angeles Lakers. Perhaps Davis is just tired of carrying a team on his back. Maybe he doesn't just want to make up the numbers and making the playoffs simply isn't good enough anymore. You can't really blame him for wanting to join a team with other star players. Sources indicate that Davis has a list of four teams that he would consider re-signing with long-term if traded to. They are the Los Angeles Lakers, New York Knicks, Milwaukee Bucks and Los Angeles Clippers. Despite this short list of candidates, you would still expect every other team in the league to at least make one phone call to Pelicans GM Dell Demps in the coming days. This news has also put the futures of Jrue Holiday and Nikola Mirotic up in the air. The former is too old to be apart of a rebuild and the latter is expiring this Summer. Could both players be traded for draft picks? The Lakers are the logical choice as a trade partner for the Pelicans. 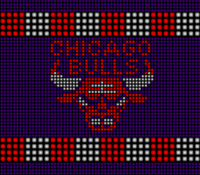 They have plenty of young assets to offer and would be desperate to add a second star to compliment LeBron James. Davis also happens to have the same agent as James. Boston would have to wait until July 1st to make this offer because of Kyrie Irving and the Rose Rule. They can offer a future star in Tatum and two quality young guards. Horford could be used as a massive expiring contract if he opts in to his player option for next season. A big four of Kyrie, Davis, Holiday and Gordon Hayward would be pretty formidable. They would certainly be favourites to advance from the eastern conference. Pairing Davis with Kristaps Porzingis would be a pretty solid move for the Knicks. It would instantly give them one of the best frontcourt duos in the league. They would be a much more attractive proposition for the likes of Kevin Durant, Kawhi Leonard or Klay Thompson if they had Davis as part of their pitch. The Pelicans would land a few promising young players and the Knicks' coveted 2019 first round pick. It is currently looking likely to be a top 3 selection and could land them Zion Williamson. Toronto could pull off another power move by landing Davis to pair with Kawhi Leonard, Kyle Lowry and Serge Ibaka. It would make them even stronger contenders. It could kill two birds with one stone. They land a star player and by doing so also convince their other star player to re-sign with them long-term. New Orleans could conceivably remain a playoff contender with a core of Holiday, Valanciunas, Mirotic, Randle and Siakam. Milwaukee could put together a decent package centered around wing scorer Khris Middleton. Although he is on an expiring contract and could leave New Orleans. Brogdon is a solid player and Maker and DiVincenzo look like decent prospects, but this offer isn't really that close to getting it done. Especially if Middleton is a rental. 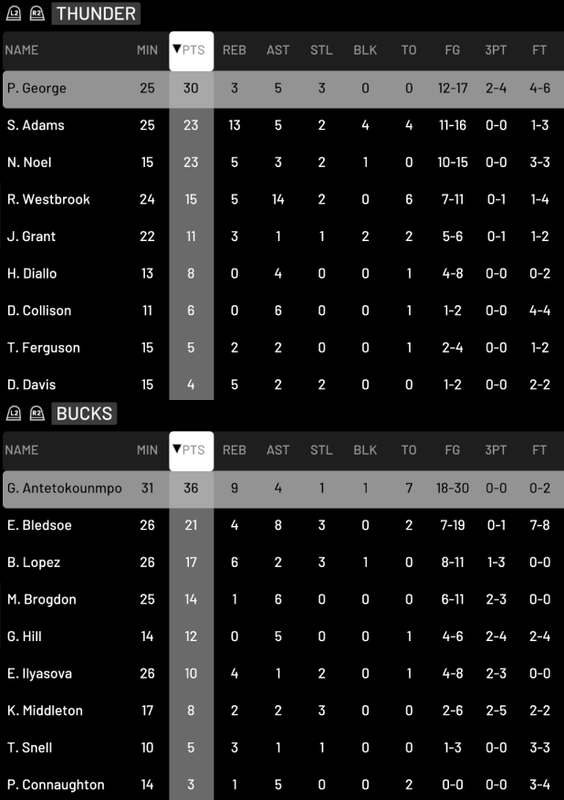 Having Davis and Giannis Antetokounmpo on the same team would almost be unfair to the rest of the NBA. Those two could be one of the best duos in the league. This one isn't really a serious proposal. It's more of a theoretical best package that Oklahoma City can offer, given that you can never rule Sam Presti out of pulling off a trade coup. 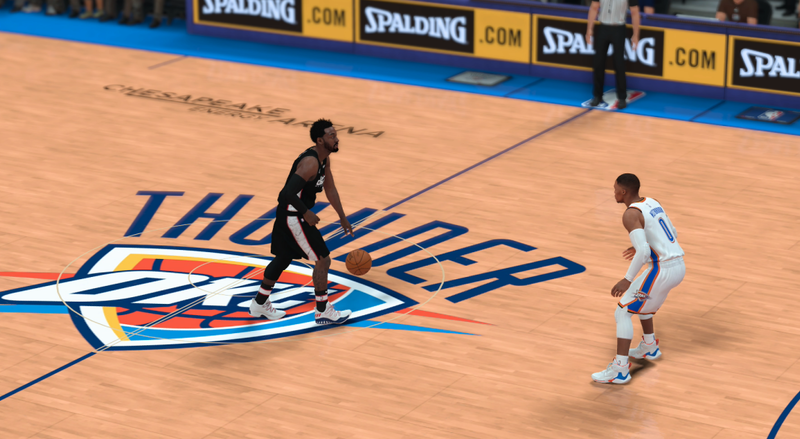 A big three of Westbrook, George and Davis would certainly put the Thunder in real contention. That line-up with Nerlens Noel and Andre Roberson would be insanely elite defensively. But it's highly unlikely that the Pelicans would even give that deal a second thought. Adams would be wasted on a rebuilding team and those picks probably won't be in the lottery, unless Indiana are poor again next season. Interested to see if he gets his wish in this reality! Just days after Anthony Davis sent shockwaves through the NBA by requesting a trade, the New York Knicks have stolen the limelight by trading all-star forward Kristaps Porzingis to the Dallas Mavericks. Tim Hardaway Jr, Courtney Lee and Trey Burke will also head to Dallas as part of the deal. In return the Knicks receive DeAndre Jordan, Dennis Smith Jr, Wesley Matthews and two future first round draft selections. Immediately on paper this deal looks to massively favour the Mavericks as they acquire a genuine star player who is still only 23 years old. Pairing Porzingis with rookie sensation Luka Doncic is a very exciting prospect, even for neutral fans. If Mark Cuban can get him to re-sign long-term and then add a third star player to the team, then Dallas may be contenders for the next decade or so. 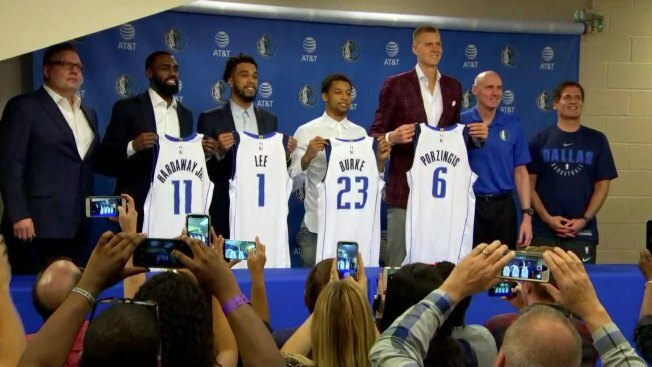 The Mavericks could still possibly have over $60 million in cap space next season, although most of that will presumably be taken up by player options for Harrison Barnes and Dwight Powell. Not to mention the big contract needed to retain Porzingis. It is strange that the Knicks have traded away the face of their franchise. But once you look at this deal more closely you see how brilliant this gamble could be for them. They may have lost a unique and quality player, but this trade opens up so much possibility for the franchise. They dumped two terrible contracts and in doing so created potentially $100 million in cap space for next season. Theoretically they could replicate what the Miami Heat did in 2010 and sign three superstars. Imagine Kevin Durant, Kyrie Irving and Kawhi Leonard teaming up in the Big Apple. Let's not forget that they also currently lead the race for college phenom Zion Williamson right now as well. A bit of luck on draft lottery night could set them up for a massive Summer. Andrew wrote: Interested to see if he gets his wish in this reality! I kind of wish I had the assets to make a proper offer for him. A big three of Westbrook, George and Davis would be so fun and could probably challenge the Warriors. No doubt! Nice idea making the real Porzingas trade, too. 06/01/19 - Minnesota fired head coach Tom Thibodeau. Hired Jacob Underwood as interim head coach for remainder of season. Andrew wrote: No doubt! Nice idea making the real Porzingas trade, too. I figured it would be interesting to use the real life trades that just happened. It should set the stage for an interesting off-season with so many teams having lots of money to spend and several stars potentially up for grabs. Looks like it's going to be a tight race with the Warriors. Perhaps they're vulnerable?